Is it time to update your corporate background check policy? Organizations that wish to keep their employees and customers safe, and avoid negligent hiring claims, implement background checks. For startups and small businesses, these background checks may be rare but still recommended. For larger organizations and enterprise companies, there could be hundreds of background checks run on a monthly basis. 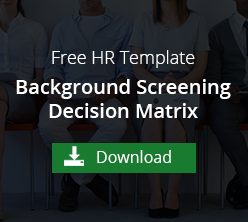 In either case, a background check policy is helpful to set guidelines for investigating applicant backgrounds and triggers for re-running background screenings on current employees. At some point, certain clues may point to the need for an updated background check policy. What's Included in a Background Check Policy? Other than what's included in a basic background check, what other screens are typically run for this particular job? At what point in the hiring process is the background check run? What information and paperwork is required before running a background check? What criteria disqualifies an applicant from working for the organization? Is this criteria discriminatory or does it follow federal, state and local laws? Has the applicant been informed that there will be a background check and that the outcome may affect the hiring decision? If the outcome of the screening is negative, what is the procedure for adverse action? Certain positions within your company require drivers. Up to this point, your background check policy for drivers required the basic background check and a drivers record. Your state has since legalized marijuana and you suspect one of your drivers has been using. Your current application process asks if the applicant has previously been accused of a crime. Your state or local area has since banned the box or implemented other fair chance hiring laws. A current employee is under consideration for a new position that wasn't included in the screening policy. What background checks should be included for the new position? Are current employees aware they could be screened again? A candidate has awesome resume and follow-up interview but her background check reveals something that your screening policy prohibits. If the negative finding isn't related to the job, took place long ago or is otherwise unharmful, do you follow the policy to the letter or change it? Obvious clues that a change is needed are when new laws or regulations highlight an old or outdated screening policy. To stay compliant, especially if applicants are denied employment, hiring managers must be aware of employer relations and hiring policies at the federal, state and local level. The policy may be outdated if employees have been through the screening process and very important and possible negligent hiring signs were missed. Or if otherwise perfect applicants pass all hiring procedures with flying colors but the current screening process still doesn't allow you to hire them, maybe it's time to re-examine what's written in your corporate background check policy. Would you like background check policy assistance? Let VeriFirst walk you through best practices in your hiring and background check process with a free demo. Click below to learn more.